The Imperial War Museum found the ashes and bone fragments during a stock-taking last year. Tests determined the remains belonged to five adults and a child, though their identities couldn't be established. LONDON (AP) — The remains of six unidentified Holocaust victims were buried in a solemn ceremony at a Jewish cemetery near London on Sunday after spending years in storage at a British museum. The Imperial War Museum found the ashes and bone fragments during a stock-taking last year. They had been given to the museum, along with other items from the Auschwitz concentration camp, by an anonymous donor in 1997. Tests determined the remains belonged to five adults and a child, though their identities couldn’t be established. 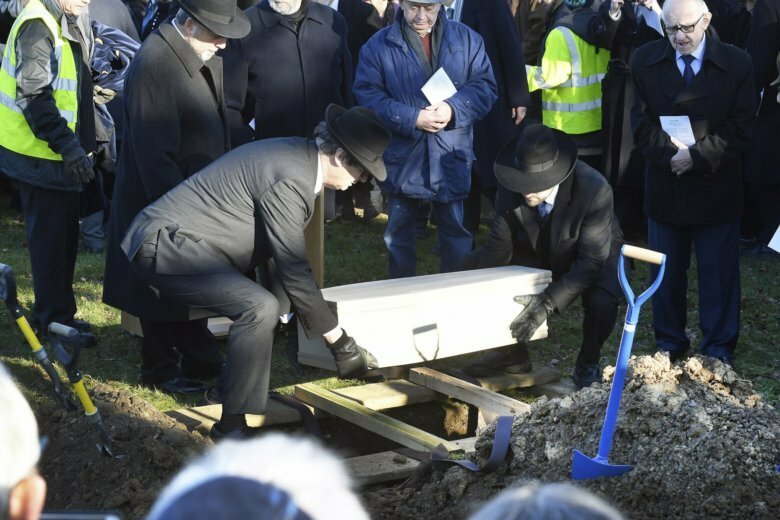 More than 1,000 mourners watched as they were buried in a single coffin in earth brought from Israel at a cemetery in Bushey, just north of London. “The message that you convey through the presence of your remains before us today is that if anti-Semitism exists, and it goes by unchecked, then hate speech can easily be translated into hate crime,” he said.